There is no question that one key feature the iPhone lacks, is a decent notification system. The iPhone does has a limited system of Push Notifications and icon badges, but when it comes down it, these methods of notification become troublesome. Wouldn’t it be great if instead of having your icons littered with little red badges, you could customize app notification badges to fit specific applications? Well now you can with a new notification system called OpenNotifier. Includes handset, envelope, speech bubble, silent, and exclamation point icons; many more available in Cydia OpenNotifier is an ongoing project, so be on the lookout for new features, including repeat notifications, status bar icons for system processes (like MobileMe syncing), and much more. Consider this release of OpenNotifier to be more of a public beta; we want to gauge feedback and see which features are most in-demand. OpenNotifier also has many addons currently available in Cydia (just like it says in its included features) to extend the default notification icon library present in OpenNotifier. Simply click the sections tab via Cydia and find the OpenNotifier App Addons section you can find a variety of icons available for use (including ones for popular applications like Google Voice). If your feeling adventurous you can also create your own notification badges and SSH them to your iDevice. 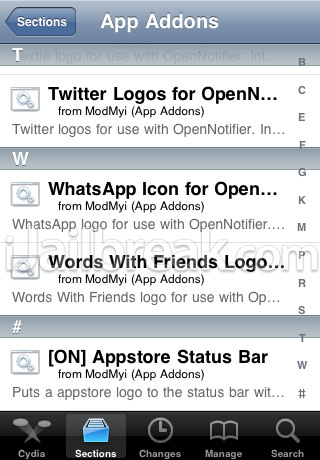 As you can see OpenNotifier adds a lot of key functionality your iDevice’s lacking notification system! 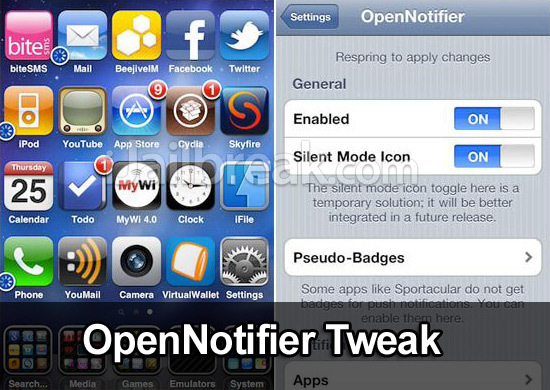 The best part about OpenNotifier is that it is available free via the BigBoss repo. Have you tried Open Notifier? Let us know your thoughts on this new notification system for the iPhone. I would really appreciate it if you would make this work with Boxcar. Right now I can’t reply to messages. Wont work.. keeps putting my ipod in safe mode… big thumbs down till that gets fixed.. any similar apps? ?